Ever run out the door with your digital camera only to realize you forgot your memory card? 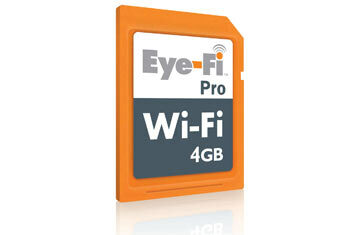 Eye-Fi's series of wi-fi-enabled SD memory cards eliminates the need to ever remove the card from the camera again. The 4-GB Pro model, which works with all cameras, doesn't just seamlessly transfer photos via wi-fi to your choice of photo-sharing sites or your desktop; it also supports the RAW unprocessed image format, leaving you with the option of post-processing pictures at your discretion. You can also choose which images and videos get uploaded via the selective-transfer mode.